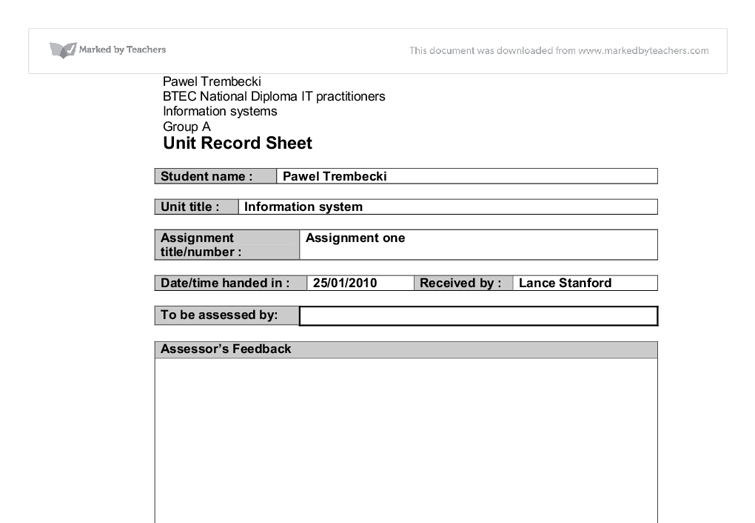 Unit Record Sheet Student name : Pawel Trembecki Unit title : Information system Assignment title/number : Assignment one Date/time handed in : 25/01/2010 Received by : Lance Stanford To be assessed by: Assessor's Feedback Criteria Achieved Student's Comments Assessor's signature : Date : Assessor : Assignment Activity Front Sheet Unit Number and Title : Unit 3 information system Assignment title/number : Assignment one Learner's name : Pawel Trembecki Assessors Name : Lance Stanford Date issued : Deadline Date : Submitted on : * Label all your work with your Name, Student ID Number and use task and page numbers, table of contents and/or references to identify all components * Sign the declaration of authenticity of work and meeting assignment deadlines Learner's Declaration I certify that the work submitted is my own. I certify that I have met the deadline date stated for this assignment. Signed: Date : Assessor's Declaration I certify that the work submitted by the learner named above is original and has been completed independently. ...read more. Some of them are member requests and some of them might be internal information which maintain and keep the business running. These can include orders for equipment or merchandise, staff training or staff recruiting. Others could be membership request or members' request of use of any facility or service. No matter what information is it has to run smoothly through the departments internally and externally so the leisure centre can keep their profits and keep the business running. receptionist members Facilities manager external supplier Senior receptionist admin and purchase team Admin and purchase team Manager of leisure services Finance department Members are booking sports activities with the receptionist who talks to senior receptionists who checks with manager of leisure services or they book conference or social parties with admin and purchase team who also talks to manager of leisure services. If available the finance department sends an invoice to the member for the services provided. Members can also book a catering or bar service with facilities manager and then also finance department sends an invoice to the member for the service provided. ...read more. An user can access it and choose to see particular information. It usually contains a big compilation of details and information and is very popular. How an organisation can improve their information system An organisation can improve their information system by introducing a new way of processing them which could be new software on their computers which will make information processing much easier. It will bring the organisation clearer understanding of information and a better way to forward them to another department or an external organisation. Quality of information can be improved by doing external surveys or search for them in internet which will bring much understanding to the issues occurring in the organisation and many new ideas about how a company can organize their tasks for maximized profit. Another way of improving quality of information can be getting ideas from other companies which is a good way to overtake the competition with the services provided and the quality of the services. ?? ?? ?? ?? Pawel Trembecki BTEC National Diploma IT practitioners Information systems Group A Information systems assignment one Sorie rezakhani 1 ...read more. 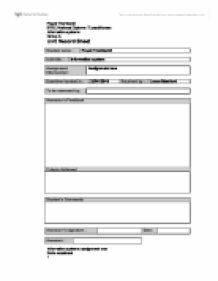 An available staff member will give them a form to fill in, and this information will then be transferred onto the system either right away or at a later, more suitable time. The Customer ID or name entered into the query is determined by the staff member operating the system at that time. Here I will discuss the appropriateness in different situations. Under different circumstances, unshielded or shielded twisted pairs may be preferred. If a company has to install a lot of transmission cabling and they think it will be installed where there is little metal interference, then UTP may be preferred. Coal Beneficiation: Coal treatment, cleansing, or preparation to remove mineral or ash material. Coke: A hard, dry substance of mostly carbon made from bituminous coal baked at very high temperatures in the absence of air, by a process called carbonization. Some blog sites are WWW.blogger.com, http://blog.linkpawn.com/ etc. Pros People who post blogs are able to express their feelings. They are also able to get jobs by companies, when the companies want to write their blogs they hire people. People can limit the people who read their blogs. Telephone Skills- being able to communicate with customers and others in a calm way, also keeping a conversation to a professional standard even if there are language barrier problems or if a customer is causing a fuss. Also if it is regular telephone work then thinking and collaborating about ways in advance about the telephone skills.